This picture has held a certain fascination for me since I first saw it in W. H. Emory’s Notes of a Military Reconnoissance. Where is this place? How big is it? What does it really look like? It was on the short list of sites I had to find and photograph. 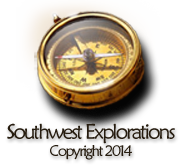 So, after locating the expedition’s November 8, 1846 campsite near the Spires (on a December 2000 trip with my father and brothers), we hiked west along the tracks of the Copper Basin Railroad to find Fire Place Rock. Emory describes this area in detail but it takes a little investigation to figure out which of the many cliffs in the area is Fire Place Rock. I’ll attempt to lay out our investigations and reasoning here in a logical and clear manner. Google aerial imagery of the horseshoe bend in the Gila River east of Florence, AZ. 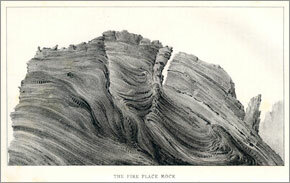 The cliffs that were examined as possible locations of Fire Place Rock are numbered 1-7. 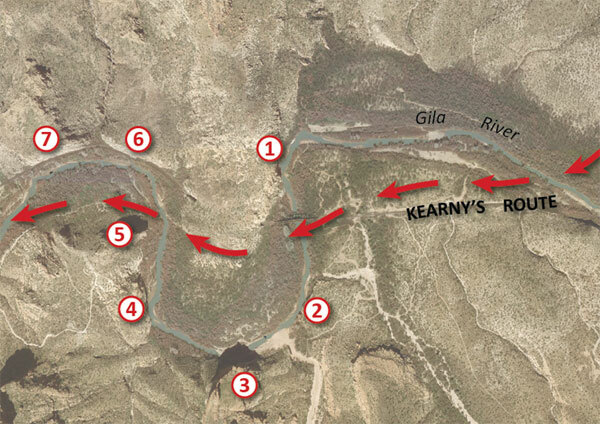 Seven possible cliffs within a mile. Emory’s “promontory of pitch-stone” [glassy rhyolite] is the dike that the river horseshoe flows around. He mentions the “fireplace” after passing the promontory, so cliffs 1-3 are disqualified. I visited this area twice to see if any of these cliffs match the picture. The only possible fit for the shape of the rock was number 7 but it lacked the swirls and dramatic coloring of the description. A little research provided an answer. There is a railroad track built at the base of these cliffs with a tunnel through the promontory. This line serves the copper mine at Mineral Creek. David Myrick’s Railroads of Arizona has a section on the building of this rail line and its tunnel. He mentions that the face of the cliffs had to be blasted away on the western approach to the tunnel. The dramatic face of Fireplace Rock now makes up the rubble in the railroad bed at its base.